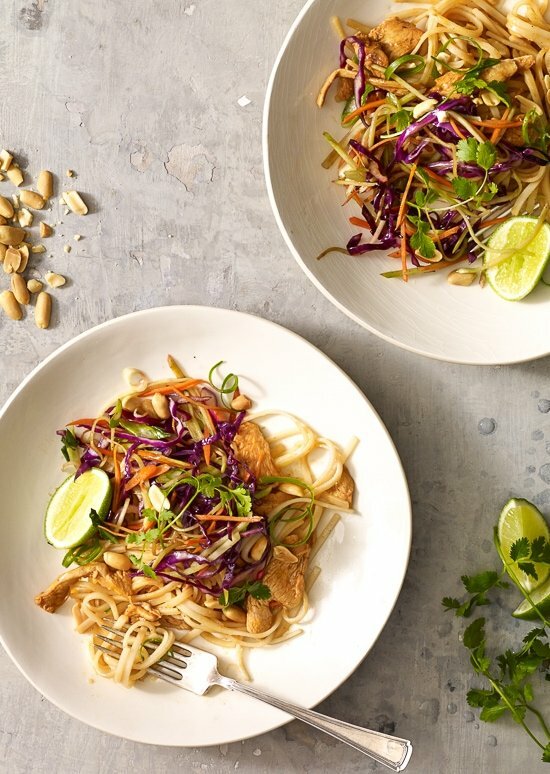 Asian Peanut Noodles with Chicken, Lightened Up is delicious, made with stir fried chicken strips, rice noodles, scallions, carrots, broccoli slaw, bean sprouts in a spicy peanut sauce. A winning combination of spicy, crunchy, sweet and salty will tantalize your taste buds. This dish was so popular on my blog I included it in my first cookbook, The Skinnytaste Cookbook (photo credit above Penny De Los Santos). To lighten up this dish, increasing the vegetables was a must, so I loaded this with plenty of noodle-sized vegetables to eat along with the rice noodles.
? I’m a huge fan, it’s low fat and tastes really good, sold at Trader Joe’s and healthy food stores, here’s the link to find the nearest store near you. If you’ve tried it let me know what you think. If you can’t find it, regular peanut butter will do, you will have to adjust the macros. Rice sticks or rice noodles can be found in the Asian section of your supermarket and make this a gluten free dish. If you can’t find rice noodles, udon noodles or even linguini would work. 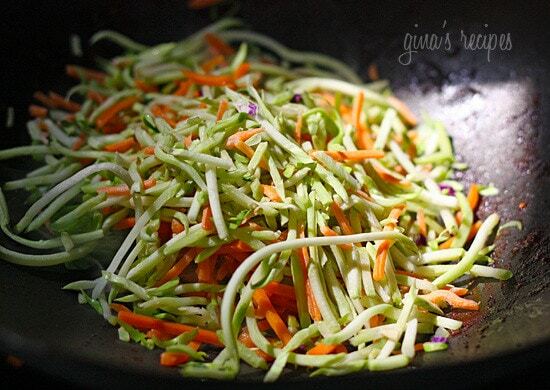 Or skip the noodles and use spiralized veggies instead (sweet potatoes would be great here). Although there’s a long list of ingredients, it really comes together quite quickly. I bought pre-shredded carrots and broccoli slaw to help speed things up. Try this with shrimp or tofu for vegetarians! 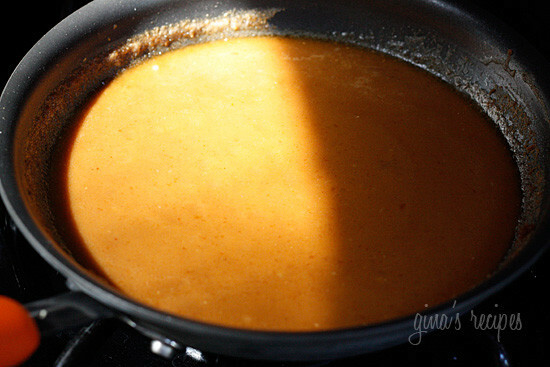 , honey, 2 tbsp soy sauce, ginger, and 3 cloves crushed garlic in a small saucepan and simmer over medium-low heat stirring occasionally until sauce becomes smooth and well blended, about 5-10 minutes. Set aside. Divide noodles and chicken between 6 bowls, top with sauteed vegetables, bean sprouts, chopped peanuts (or you can toss everything together to hide the vegetables so your family members don’t push them aside!) and garnish with cilantro and lime wedges. When i put this into the WW calculator, it’s only coming up as 5 points. anyone else? Hi Kayley. The only accurate way to determine any recipe’s SmartPoints® value is to plug the ingredients into the recipe builder on the Weight Watchers website (Click on “My Foods,” select “Recipe,” and click “Create a recipe.”) which does not count fruits and vegetables in recipes in the calculations as they are now 0 points. Delicious! 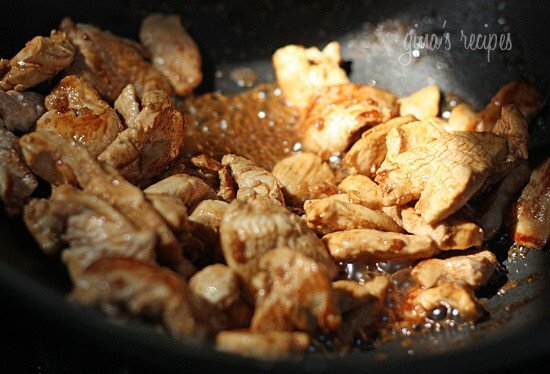 I moved step 3 up to Step 1 and marinated the chicken while prepping everything else and it came out so flavorful. Cant wait to have this as leftovers! If you are confused about the directions concerning the garlic and sesame oil. The recipe is in Gina’s 1st cookbook “The Skinnytaste Cookbook “. The directions there are very clear. If you don’t have the cookbook, you’ll have to wing it. But you really can’t ruin this recipe if you take the total amount of garlic and just divide it. Great recipe! Good luck! One of our favorites! I just use natural peanut butter, and follow the recipe as is. The whole family devoured it. It was delicious! This is my favorite recipe so far. I felt like I was a chef after tasting it. My sixteen year old daughter looks at it and said what is this?! Then she tried some and went back for seconds and thirds. Gina, thank you for the wonderful recipe and giving me time with my family at the dinner table having a healthy meal. Absolutely delicious!!! My picky husband said “it’s a keeper” Win Win! Gina, I’d like to make this but can’t reconcile the ingredient list with the instructions for the garlic. I see others have asked but I haven’t come across a response. Help?! I ignored the ingredient list and followed the amounts in the directions I used 3 gloves in the peanut sauce, 4 cloves in the chicken, 2 cloves in the slaw mix. I’m not sure if that’s right but it was delicious and you really can’t go wrong with adding a little extra garlic. Amazing, made this last night for my picky family. And they all loved it! I will definitely make this again! This was one of the first Skinny Taste recipes I ever made and let me tell you it is absolutely delicious. The hubby and I are really into Asian food and also like food with a little spice. This provided both for us. 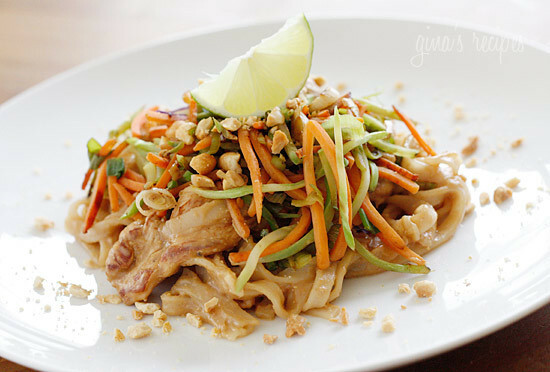 We were able to enjoy peanut butter noodles without the guilt or the grease! Definitely a MUST try! 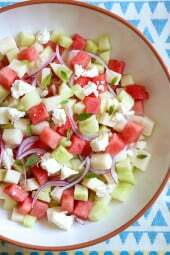 I’ve made a lot of your recipes and have enjoyed them, but have never commented! This one was extra delicious! I used real peanut butter and skipped the rice noodles, so we had the chicken over the broccoli/carrot slaw. I could literally eat this every day. Crunchy, healthy and tasty. Thank you so much for the fantastic recipe. Husband loved it too. This recipe was AMAZING!! One of my new favorites for sure! I used shrimp and tofu instead of chicken, and Justin’s classic peanut butter instead of the Better’n peanut butter since I couldn’t find that at the grocery. I also subbed Chinese lo main noodles because I couldn’t find rice noodles. It still tasted so delicious, I can’t stop raving about it! This is crazy good. No alterations needed whatsoever. ?? I made this for the first time last night, and it was SOOOO good. You would never believe it’s under 400 calories. Thanks for another great recipe, Gina! thanks for the awesome recipe! just had dinner with my husband and he’s asked to put it in the rotation! Wow, so impressed with this recipe! I made it with sweet potato “noodles”, otherwise stuck to the recipe. The hubby (who is super picky) absolutely loved it! Will definitely be making again in the near future. This was fantastic. Everyone loved it. Better than something from a restaurant. Even better on the second day. very tasty, but waaay too many noodles! 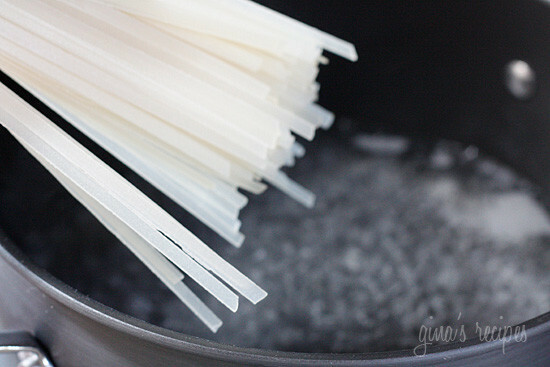 cut noodles in half! I’m very interested in trying this recipe. For those that used [email protected], did you mix the peanut butter with water and put it in or did you just put the powder directly into the chicken broth? Confused how much/when to add garlic. Also, sesame oil is in the ingredients list, but not in the directions. Also directions very confusing re garlic and sesame oil… as far as the garlic goes, I would use 2 cloves in the peanut sauce as listed, I would divide the 4 cloves between the chicken and vegetables. Or use more, it can’t hurt. Made this for dinner tonight and instead of using noodles, I made zoodles. The whole family really enjoyed this and liked the heat of the siracha. love this recipe! another Skinnytaste win! we just use natural peanut butter bc that is what we have and it turns out great. not sure on the garlic-seems the recipe and the directions are a little confusing, but I just use what works for us. Also, can never find bean sprouts without making a special trip somewhere-not sure why, bc we used to be able to find them, but it tastes great without them. Love this and so does my family. Definitely a keeper and in our dinner rotation. you won’t be disappointed. This was INSANELY good – can’t wait to have the leftovers for lunch again tomorrow!! 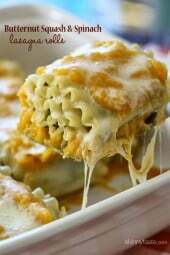 One of the best recipes by far…and I’ve made a lot of these recipes! So excited to make this tonight for dinner! I’m planning on subbing the peanut butter for PB2 which makes this 4 WW freestyle points a serving! That’s what I did and it was wonderful!! Did you mix the PB2 with water first or just add the powder in?? & then how much did you use? So delicious!!! The perfect balance of spice, sweet, crunch!!! This recipe is amazing! We used PB2 because that’s what we had on hand, and it came out super delicious! Did you mix the PB2 powder with water first & then add 5 tbsp of it pre-mixed? Or did you just add 5 tbsp of the powder? Did you use 5 tablespoons of the PB powder? Anyone else notice that in the ingredient list for the sauce, it says 2 cloves garlic, minced. In the recipe it says 3 cloves crushed garlic. It’s not a terribly large difference, but which is it supposed to be? This recipe has another issue. The ingredient list reads 4 cloves garlic, crushed. 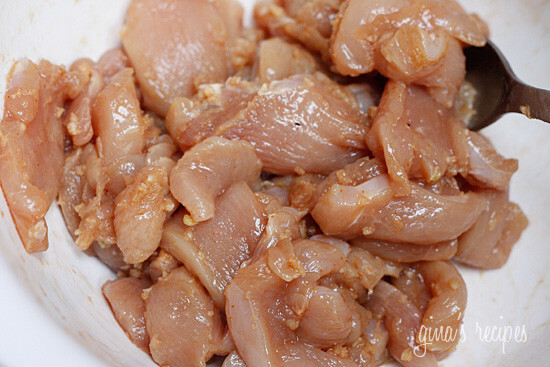 In the recipe, step 3 is has garlic mixed with the chicken. Later in step 5, it lists 2 cloves of crushed garlic. Does that mean we are to only use 2 cloves of the 4 in the ingredient list for the chicken and 2 cloves saved for later? Someone needs to review the details for this one. Love this recipe! Used natural peanut butter. My boys loved it and my husband woke up at 2:30 in the morning to have seconds! Thank you for sharing. This is an awesome recipe. I just was looking up the recipe online to double check my WW point calculation. I did notice that your cookbook version does not contain bean sprouts. I will definitely have to add them the next tome I make this for my family. Thank you. My family loves your recipes. 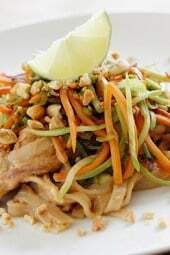 My 4 yo kept asking for Pad Thai. And he gobbled it up and asked for more! I love how delish it is without all the fat! Thank you. Do you have the information for WW Freestyle or the saturated fat amount? Wow, what a great recipe! I used regular peanut butter and subbed Shredded Cabbage for the bean sprouts as they didn’t have them at the store. I am about to go get seconds… And even my picky kids loved it. Thanks! I believe the points are the same. You can do an online search of nutrition if you are unsure. Do you have the updated points for FreeStyle? 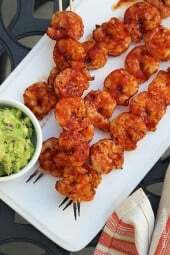 This is one of my favorite recipes on your site! Boyfriend loved it, too. Can’t wait to try this tonight! Sorry for the dumb question but – If I use regular peanut butter instead of the powder do I still use 5 tablespoons? Thanks! Any ideas for a substitute for the sriracha? My daughter and I can’t take too much heat? Can’t wait to try this! One of my favorite Skinny Taste meals to date. So stinking good! Can I omit the chicken so that my vegetarian boyfriend can eat it? How many points do you think it would be if you subbed zoodles for the noodles? Just made this and it’s delish!!! One note though — the ingredient quantities noted for the sauce in the summary are not the same as what’s in the numbered instructions. Caused me to make my sauce with 14.5 oz chicken broth instead of 8…and i kept wondering why it didn’t thicken…until i looked a little closer! I had read the numbered instructions, then scrolled up to the ingredients list as i added everything to the saucepan. Apparently i also ended up with less garlic than i should have, as those quantities don’t match either. You are correct! Changing it now!